This year I’m going to detail much more of the different types of tools I use to be financially responsible. One website that I’ve been using for a while is Saveup.com. It has been seen on many reputable publications such as: The New York Times, ABC, Wall Street Journal, Forbes, and more. This website aggregates your bank, credit card, retirement and investment accounts and tracks the spending and saving that you do. The setup is similar to Mint.com but the main difference is that Saveup.com focuses more on how much you don’t spend, and how much you pay down your account balances. If you're worried about sharing your personal information, you should know that data aggregation used by Saveup.com is provided by a company called Intuit, owners of Mint.com. Saveup.com is free to use, with no hidden fees. 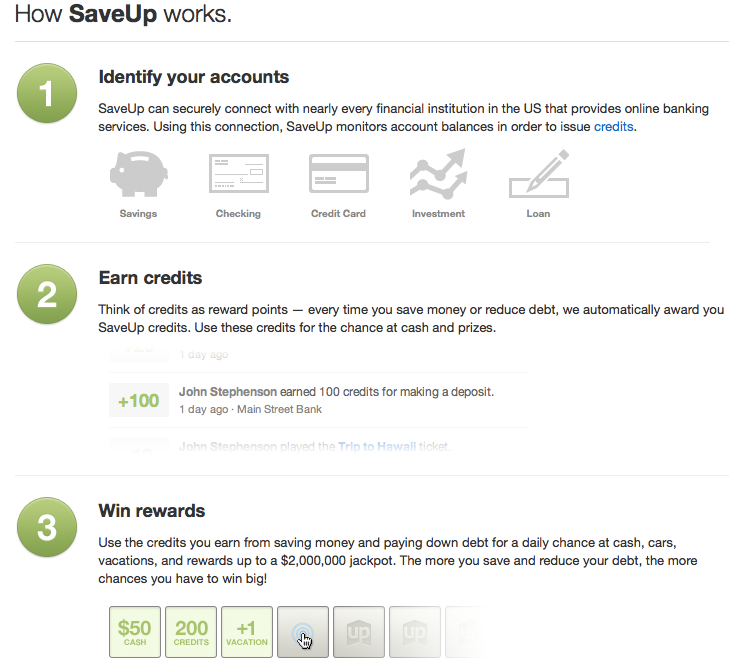 Saveup.com rewards you with credits every time you deposit money into your bank account, or pay down your credit card debt. You are given 3 plays a day. You can exchange 100 credits for an extra play (up to 8 total per day). You can earn more credits from saving money and paying down debt. 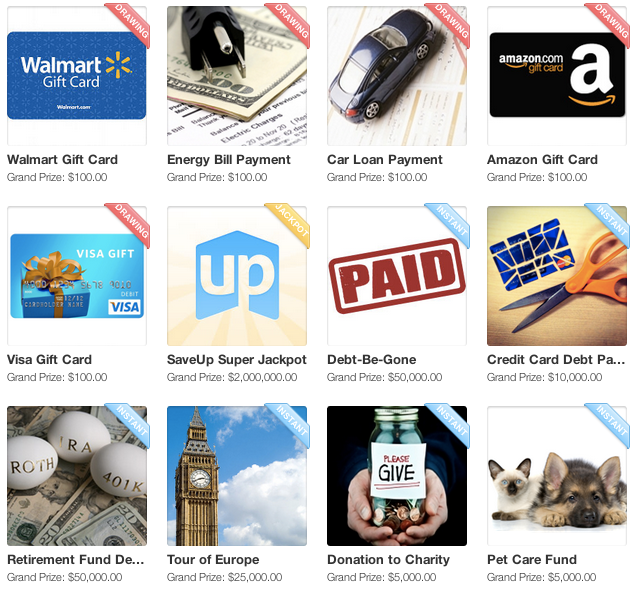 With these credits, you can play for a chance to win multiple prizes – some are small like a $100 gift card, others are much bigger such as a free vacation or even their $2,000,000 jackpot. There are a few games you can play for instant prizes, but I prefer to enter the drawings. Last month, one of the prizes offered in a drawing was for a 1 gram bar of Platinum, valued at $85. I thought this would be an interesting prize to win and so I entered the raffle for the Platinum bar everyday. I logged into my account last week and to my surprise, I had actually WON the platinum bar! So take it from me, this site is legit. Also I’ve won a few dollars here and there in the big jackpot prize by matching a few of the numbers. You can sign up with my referral here (If you do I earn 10 plays). If not it’s okay. I earn a lot of credits automatically for simply doing what I do best: saving up. You can watch a video and read more about Saveup.com here. Now go sign up and have fun earning credits and playing for prizes! Thank you for the heads up, I just updated this post to reflect that change.